"But I could now paint no longer; my broken spirit, bruised with so many horrors, shut itself entirely to my art." Grace, elegance and a welcoming manner, these words might as easily describe the personalities portrayed in the portraits by Elisabeth Louise Vigée Le Brun, as the artist herself. Normally a tedious process, Vigée Le Brun's reputation as a lively conversationalist, in addition to her demonstrably expert talent as a painter, were significant to a clientele that often dreaded the notion of having a portrait made. The active engagement between the artist and her subject is evident in the finished portrait, as her sitters appear both relaxed and animated. She quickly won over her most famous and loyal supporter, none other than the controversial Queen of France, Marie Antoinette. In her hands, we see Marie Antoinette take on the roles of queen, equestrian, fashionista, and mother - some portraits are scandalous while others follow royal protocol. Madame Le Brun, as she was commonly known, was an embodiment of French aristocratic culture, which remained a key trait of her style and success in her period of self-imposed exile during the French Revolution. In all, the prodigious artist produced approximately 800 paintings with a long list of royal patrons actively seeking her flattering portrayals across Europe. Although the portraits of Vigée Le Brun might look traditional to contemporary viewers, she was not shy in breaking established norms in the genre. For example, the welcoming gestures and slightly open-mouthed smile, as if in greeting, found in many of her portraits caused quite a stir when debuted. What first caused scandal, however, soon became style, as the pleasing naturalism and relaxed manner of Vigée Le Brun's portraits became immensely popular among the elite and trademark of the artist's distinctive style. 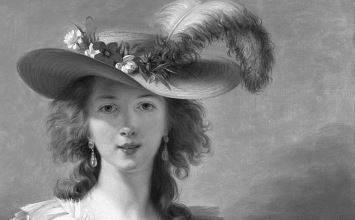 The odds facing women artists in the 18th century were nearly insurmountable. The vast majority of women who were able to make a living in the arts learned their trade from their fathers, as did a young Elisabeth Vigée. Her father's early death, however, and the inability for women to receive training as an apprentice or in the academy, meant that the artist was virtually self-taught. From such inauspicious beginnings, Vigée Le Brun developed into one of the leading artists in all of Europe, able to command higher prices for her portraits than any other artist of her time. Vigée Le Brun's fame was secured in 1778 when she was summoned to paint her first portrait of the young Queen Marie Antoinette. From that point, Vigée Le Brun was the queen's favorite portraitist, creating 30 portraits over the next decade of the ruler who preferred fashion to royal protocol, often causing a scandal in the process. For example, on more than one occasion, the queen preferred a sense of autonomy in her portrayal as opposed to the lavish trappings of the French court, donning the simple attire of a peasant (or the queen's notion of a peasant). The Rococo style was in decline by the time of Elisabeth Vigée Le Brun's introduction to the French royal court. In her able hands, however, she deftly combined the grace and elegance of this earlier style with the composure and decorum of the nascent trend of Neoclassicism. 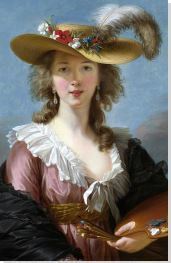 Although she would never adopt the hard, linear style associated with the high Neoclassical tradition, most notably in the history paintings of her contemporary, Jacques-Louis David, she found ways to integrate notions of the past, such as in adopting the attire of antiquity, into her portraiture. French culture was widely influential in Europe during the 18th century. Whereas her royalist position would put Vigée Le Brun's life in danger in revolutionary France, it was an asset to the artist abroad. Her highly sought-after style of portraiture represented the height of aristocratic French culture to patrons in Italy, Austria and, perhaps above all, the Russian court of Catharine the Great dramatically increasing the prestige of the artist. The daughter of a French pastel portraitist, Elisabeth Louise Vigée was born in Paris in 1755. In her published memoirs, titled Souvenirs, she describes how she was attracted to drawing from a very early age, admitting, "I scrawled on everything at all seasons; my copy-books, and even those of my schoolmates had their margins crammed with tiny drawings of heads and profiles." Her doting father, Louis Vigée, enthusiastically encouraged her nascent artistic efforts, allowing her free reign of his studio and materials. Dramatically lit, this Neoclassic portrait of the Landscape painter Hubert Robert does more than present a mere likeness of the sitter. Set in an austere environment, a common trait of Neoclassic portraiture, Robert casually holds his palette and brushes in his left hand, while the right rests on a ledge, creating a sense of fluency and mastery of his trade. Cleverly Vigée Le Brun has utilized the motif common for an artist's self-portrait and used it for the portrait of her colleague; such that the subtext becomes a dialogue between the two painters. It is a conversation interrupted, however, as Robert, momentarily distracted, looks sharply to our right, beyond the view of the canvas. With an almost snapshot like composition, decades before the advent of the camera, she captures in his posture a sense of familiarity, and with his focused gaze, his intellect. A common misconception of Vigée Le Brun is that she was primarily a portraitist of women. In fact, she painted an almost equal number of men throughout her career. Some of the critique Vigée Le Brun has received by contemporary historians points to an inconsistency between the representation of her male and female sitters; notably that she creates an air of authority in her male portraits, in contrast to the softer style afforded to her woman clientele. As Chadwick notes, "The brusque, taut surfaces and intense gazes of male sitters in Vigée Le Brun's portraits of the painters Joseph Vernet and Hubert Robert are almost entirely missing from her portraits of women. The focused mental energy of these figures (Robert's hair springs from his head as if electrified) are in sharp contrast to the many portraits of women with the softened contours and misted surfaces." Artist biographer Meryle Secrest echoes this sentiment, who notes in contrasting Vigée Le Brun to Gainsborough for ArtNews, "Vigée Le Brun, for instance, was making masterly studies of men, but her women too often conform to the clichés of her age." Whether Vigée Le Brun's portraits of women simply conform to clichés, rather than symbolize their elevated status and social position, remains a source of debate. Peace Bringing Back Abundance, is a departure from the portraiture for which Vigée Le Brun was best known and sought after. Instead, she creates an allegorical scene, a subgenre of history painting, depicting a quiet moment between two symbolic female characters representing Peace and Abundance. Vigée Le Brun submitted this piece for her successful application to the Académie, or the French Royal Academy of Painting and Sculpture, albeit with assistance from the queen. Her admittance to the academy, which allowed only four women at any given time, was a double challenge to the restrictions and prevalent gender stereotypes of her time and her marriage to a commercial art dealer. That she did so with a history painting further conflated the issue. As Mary D. Sheriff describes in her text, "Because history paintings displayed and required imagination and judgment two central components of reason they traditionally belonged on the side of the masculine." As an allegorical work, Peace Bringing Back Abundance fulfills the requirements of a history painting. In Vigée Le Brun's hands, it also blurs the distinctions between the Rococo and Neoclassical styles. On the right is Peace, identifiable by her olive branch, who is guiding Abundance, with her harvest of fruits and wheat. It is suggested that peacefulness and plentitude go hand-in-hand; two figures are clad in billowing, crisp drapery come together in an undefined, ethereal space. "Although two women are represented," Sheriff argues, "in terms of contemporaneous painting codes they are alternately gendered as "masculine" (Peace) and "feminine" (Abundance)." As Sheriff continues, "Reading the gendered distinction as representing power and dependency, with Peace guiding and controlling the pliant, sensual, and dependent figure of Abundance, signals not only the painting's eroticism, but also the allegory's meaning." Additionally, the soft, powdery glow of Abundance's skin, her bare breast as well as the texture and color of her drapery, align the representation of Abundance with the Rococo style. Conversely, the darker attire and brunette hair of Peace, often allied with masculinity, and her crown of laurels might hint at the Neoclassicism, a trend towards rationalism in art that was beginning to emerge at this time. Vigée Le Brun's Self Portrait in a Straw Hat is both a confident portrait and an ode to the influence of Peter Paul Rubens. Similar to the Flemish painter's earlier portrait of Susanna Lunden, known as The Straw Hat (1622-1625), the artist paints herself in a garlanded and feathered straw hat and swathed in lush fabrics of white, pink, and black. Unlike the sensuality of the earlier painting, as Susanna looks coyly toward the viewer in low-cut bodice, Vigée Le Brun's self-portrait establishes the attractive young woman as a confident artist. She holds her brushes and palette in one hand with the other in a gesture of friendship. The artist directly meets the gaze of the viewer, mouth upturned and slightly opened, as if in mild amusement or about to speak, while positioned in front of a clouded, but otherwise empty sky. Self-image was vital to Vigée Le Brun's popularity, and here she fashions it with virtuosic skill. As Katharine Baetjer notes, her beauty was very much part of her appeal and selling power, and here she emphasizes her youthful blush, almond eyes, and white breast almost revealed as the left side of her dress drops open somewhat. At the same time, the richness of the clothing not only projects a sense of luxury and wealth, but also extremely skilled painting - something also evident in the texture and shine of the paints on her palette. What is suggested is that a portrait by Vigée Le Brun will not only be flattering and sumptuously detailed, but that even the sitting itself will be improved by the presence of such a beautiful and amiable artist; fine art and advertising become almost one and the same. The widely-acknowledged influence of Rubens also announces Le Brun as a painter who is aware and worthy of the tradition of the Old Masters, as indeed she was. This portrait depicts Vigée Le Brun's most important sitter and patron, the queen of France. Marie-Antoinette stands with her body turned slightly to the right, facing the viewer with a look that seems calmly amused. She holds a small bundle of a rose and some leaves, which she binds together with a ribbon as if she has just plucked the flowers from the lavish gardens of Versailles, suggested by a rosebush, small patch of sky, and large tree in the background. While this painting meets the elements required of a royal portrait, that knowing smile suggests there is something more to this story. This portrait of Marie-Antoinette is actually a replacement painting for a scandalous work that was originally shown at the artist's first entry to the Salon in 1783. Instead of the refined blue silk and lace gown and required royal accoutrements, the queen was depicted in a simple chemise dress, without the restrictive corset, and her natural hair, slightly tousled, pulled back underneath a straw hat. The attire appeared more akin to undergarments than appropriate attire for a royal portrait. Additionally, she holds a pink rose, which was read as a symbol of her Habsburg identity, instead of symbolizing the wealth and splendor of the lavish royal, and French, gardens. After a public outcry, it was quickly removed and replaced with the painting seen here. The rich abundance of surfaces and textures on the queen's attire, from the crisp satin and delicate lace of her dress to the nebulous puffs of her wig and feathers, signal her absolute wealth, elegance and royal position. The trademark features of the Habsburg family are softened, as in all of Vigée Le Brun's portraits of the queen, creating a wonderfully flattering image. Her long neck, erect posture, and calm gaze all convey a sense of power. This is contrasted with the delicacy of her extended little finger, and the fact that she does not touch the rose directly at all. The brightness of her skin and sky-blue dress stands out against the darkness of the foliage and evening sky, so that she appears illuminated by a divine light. Along with Jacques-Louis David's Oath of the Horatii (1784), Vigée Le Brun's official state portrait of Marie Antoinette with her Children is among the most important paintings of the pre-revolutionary era in France. It was, in fact, David's advice to Vigée Le Brun, both working in the royal court, to arrange the composition in a pyramidal formation, evoking the Madonna paintings of the great Renaissance painter Raphael. Although the leading portraitist of her time, commanding even higher prices than the great David for her portrait paintings, she was not often charged with multi-figure groupings such as this. This painting was commissioned after a resoundingly failed attempt at the subject of the queen and her children by Adolf Ulrik Wertmüller commissioned by Gustav III of Sweden. Today, this work is chiefly recognized as a propagandist image, in that it was created to revitalize the public opinion of the queen, whose reputation was tarnished by rumors of extravagance, infidelity, and other malicious behaviors. The queen was never a popular sovereign in her adopted country of France. Her refusal to concede to court pressure, such as rarely wearing the proper attire (including the hated royal corset), only made matters worse. The massive state portrait, a full nine feet tall, is an embodiment of proper regal authority. The queen is dressed formally, wearing a luxurious red gown, powdered wing, and a symbol of the royal crown rests on an armoire in the background. She is surrounded by her children in a room adjacent to Versailles' extravagant Hall of Mirrors seen in the background. Her eldest daughter looks adoringly up at the regal mother, who holds her youngest child, who would have typically been with a wet nurse, on her lap. Evangelia Karvouni describes in a 2014 article for The Journal for International Women's Studies, "The figure of the Queen with a lively baby on her lap and her daughter leaning affectionately against her brings to mind Raphael's, 1483-1520, portraits of the Virgin Mary with child Jesus and St John the Baptist, such as for example the Madonna of the Meadow." The young dauphin, son of the king and heir to the throne, stands independently while gesturing toward the empty cradle, symbolizing the queen's fourth child who sadly died at 11 months old. Unfortunately, the painting was not particularly successful in its mission. The posture and facial expressions of the queen were criticized for being too stiff. The depiction of the immense jewelry armoire in the background, was also of symbolic importance, for it is accorded only a secondary position in the composition. Instead of showing the queen wearing extravagant jewelry, she is "showing her children as treasures" in front of her riches, as seen in the popular depictions of the Roman heroine Cornelia. This was meant to counter a recent scandal involving a stolen necklace of immense value rumored to have been made for the notoriously extravagant queen. That the necklace had been made for the prior king's beloved mistress, the ever-popular Madame du Barry, was dismissed by a discontent public. Although the queen is noticeably not wearing a necklace in this portrait, the association to the rumor was too powerful to overcome. Vigée Le Brun's reputation, however, was not marred by the negative reception of this painting, she continued to command high prices for her portraits until she fled France as the rioting citizens marched on Versailles on October 6, 1789. There are no trademark signs of her professional status as an artist in this image, instead Vigée Le Brun simply paints herself with her daughter Julie. The two are set against a bare, softly illuminated background and clasp each other in a warm embrace whilst looking towards the viewer. They are not clothed in fashion that would have actually been worn during this period, but dressed in a manner that evokes the ancient past. This represents the rising influence of the Neoclassical style on artists working in France. The use of Neoclassical clothing is a marked difference from Vigée Le Brun's earlier portraits of this type. Although it might be seen as a fashionable affectation, it could also be interpreted as lending the gravity of the classical to motherhood and female relationships, where it was usually only reserved for masculine fraternity and civil values, particularly in the paintings of Jacques-Louis David. Although Vigée Le Brun was undoubtedly the most successful female painter of France, and beyond, her legacy was overlooked nearly two centuries following her death in 1841. Her revival in the 20th century, however, has not always been positive, with notions of vanity and sentimentality clouding the resuscitation of her legacy. A well-known example, the influential twentieth-century French theorist Simone de Beauvoir disparaged Vigée Le Brun for portraits such as these, writing: "Mme Vigée Le Brun never wearied of putting her smiling maternity on her canvases." To devalue both the subject and the painter, however, seems a troubling endorsement, rather than challenge, to the disparity of recognition this unarguable success achieved in a notably male-dominated vision of art history. Vigée Le Brun reconciles the stoic Neoclassical style with an intimate view into the relationship of mother and daughter, manifest in the contact between the bare flesh of both of these figures. The two become almost one, and their extreme proximity and shared gaze unites them against the viewer. Sadly, this close relationship would become estranged during their stay in Russia, only to be united shortly before the daughter's early death in 1819. The Portrait of Emma, Lady Hamilton, as Bacchante, depicts the famous, and scandalous, society figure in the guise of one of the ancient worshipers of Bacchus, the god of wine. She looks at the viewer over her shoulder, holding a tambourine above her, with her hair and dress tumbling behind. In the background, smoke ominously spews from a volcano. "The life of Lady Hamilton is a romance" wrote Vigée Le Brun whilst in Naples, and she was certainly correct. An actress-turned-noblewoman, the fashionable Emma had a series of high-profile affairs, including with Lord Nelson, and was the muse of artist George Romney. She was also famous for her "attitudes," a charade-type affair in which she dressed up and posed in the guise of different mythological figures calling upon the audience to guess which goddess or nymph she portrayed. Upon seeing such a performance, Vigée Le Brun was very much impressed with Lady Hamilton, calling her "admirable to behold." A sense of Lady Hamilton's balance between sensation and scandal is evident in Vigée Le Brun's depiction, which mixes playfulness with an underlying sense of chaos. Combining her lyrical Rococo style of portraiture with Neoclassical history painting, the figure marks a dramatic diagonal line from top left to bottom right. Her smile as she turns to the viewer, as well her clothing, hair, and the gentleness with which she holds her instrument, suggest a lightness and elegance. Vigée Le Brun depicts her subject smiling with her teeth showing, which was, although a trademark of the artist's animated style, highly controversial for portraiture at the time, perhaps also reflecting Emma's unconventional reputation. The Bacchantes themselves were devotees of Bacchus who would supposedly drink and dance themselves into an orgiastic and violent frenzy. In Euripides' play The Bacchae, these women are so overcome by the libertine deity that one of them tears her own son to pieces. This sense of danger hiding underneath her beauty is echoed in the landscape, whose soft smokiness and mountain-peak hint at a devastating eruption. The dark plume of rising ash appears to be clasped by Lady Hamilton, as if she embraces the destruction it portends.